Three sisters in Shanghai: is one my mom? 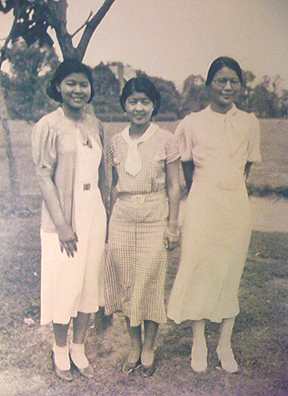 Beloved Aunty Yun is at the far right, Aunty Inez is in the middle, and at first glance I identified the sister on the left as my mother, age 18. But looking again, is it she? Maybe, maybe not. In the 1930s after my grandfather Chong How Kong died, my grandmother Siu Chin and many of her 14 children and their young families went to China from Hawaii, mostly as tourists. Some taught at the university level or worked. With my Uncle Fan’s and Aunty Yun’s tuition and room & board support, my mother went to the University of Shanghai to study music, English, and education. They were all there until World War II broke out in China, and they made their way back to the Islands. Otherwise they may have stayed in China, and probably I would not be here. Mom continued her college education at the American Conservatory of Music in Chicago, returning to Honolulu to teach and direct music when she finished. My mother was a member of the Mid-Pacific Institute Class of ’34. According to J. H. Kim On Chong-Gossard’s writing, our family genealogist, she traveled alone to Shanghai in September 1935. If she is in the photo, then one of the dates is wrong. I emailed the photo to Cousin Millie, asking what she thought: Fo-Tsin (my mother) or Lois (Millie’s mother)? For Lois was in Shanghai too. Of course neither I nor Millie was born yet. I just haven’t seen a picture of my mom that full of face, but perhaps at 18 she was heavier than I’m used to seeing her in other photos. I usually recognize her high angular cheek bones. Photographers loved using her as a model. While waiting for Millie’s opinion, I went through mom’s letters, photos, and other papers I still can’t throw away, even though I have no real heirs to save them for. I guess I’ve saved them for me, for a day like today. I found one of her report cards from the University of Shanghai dated February 19, 1935. Another records that she entered the U. of Shanghai in Spring 1935. I also found a letter she wrote to Aunty Nyuk in California, dated January 12, 1934, from Peiping [now Beijing]. Aunty Nyuk kept all of the correspondence, and after she died, the letters found their way to me. With all of my 14 aunties and uncles and their spouses now passed, it’s like piecing together a puzzle to get a fuller picture. Some things are nice to keep. Unless Cousin Millie thinks that’s Lois on the left, I’ll gladly say, that’s my mom and my aunties! Epilogue: Millie says not her mom. It’s interesting to look at my collection every once in awhile, then I put them away and get on with the present. I recommend that identities of people and the date—at least the year—be noted on the back of photos to avoid misconceptions later! Or perhaps people prefer the mystery! Having recently received a CD from my one cousin with over a hundred photos of my mother’s family contemporaneous to when she was growing up I know the enjoyment of having these photographs to view.